While most newlyweds-to-be know that they need to carefully evaluate and review all their potential wedding videographers’ galleries to ensure that they have an idea of the kind of video they can expect should they decide to work with them, we’ve been doing wedding videography in NJ for long enough to know that many have no idea what to expect beyond that. Aside from the video itself, they don’t know what they can expect from their videographers in terms of their process and behavior, the kinds of equipment they may be bringing along, how they’ll work with your photographers if you get them separately, etc. So, we thought we’d break it down so that you and your partner know exactly what to expect from your videographers. They’ll be less intrusive than you may think. One of the biggest hang-ups that people have with wedding videographers, and photographers for that matter, is that they think these kinds of vendors will ultimately be a distraction from their and their guests’ experience of their wedding day. However, if you choose wisely, then that should absolutely not be the case. It’s not that there aren’t videographers out there who get in the way and end up distracting couples and their guests from the moment, but that’s what evaluating and reviews are for. It’s up to you to do your homework into each vendor, but if all you hear and learn while looking into a videographer is how quiet and considerate they are, then that’s what you can expect. We’ve even had couples go so far as to call our videographers “ninja-like” in their ability to capture beautiful shots without anyone knowing they were doing it, but the point is that if you find the right videographers, then you can expect them to get the job done without distracting from your wedding day experience at worst, and without you even knowing they’re there at best. Bulky videography equipment is a thing of the past. Another one of the biggest hang-ups that couples have with videographers is the equipment they use, or the equipment the couples think they use, because unless you’re in the film & video industry, then you probably don’t realize just how far certain tools and technologies have advanced. First of all, cameras are pretty compact in general now, but then there are the extras like sliders and steadicams to consider, tools which weren’t even seen at most weddings in the past. 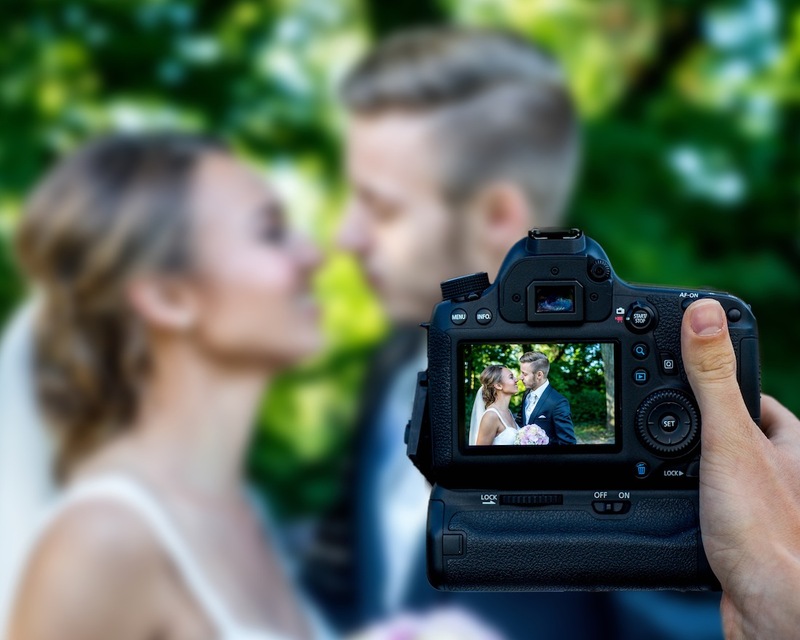 That’s why many couples have no idea what to expect from that equipment and, as a result, often end up leaving those kinds of tools out of their packages, or forgoing videography altogether. The truth, though, is that film & video equipment has gotten smaller and more compact across the board. In fact, you may be surprised by how little space your videographers’ tools take up on your big day. Yes, they may have to set up a tripod here and there, but other than that, most of the equipment they use can be carried right on their person. They should have no issues working with your photographers. Look, there’s no doubt that you’re usually better off getting your photography and videography from one place. That way, you won’t have to worry about how they may work together once your big day arrives, but that doesn’t that you can’t hire the two separately, nor that you shouldn’t then expect your videographers and photographers to work together seamlessly. Again, it really goes back to your hiring process, and if you did your homework and took your time, then you shouldn’t have to worry. Just make sure to let your videographers know that you’ve got different photographers so that you can discuss their process for working with others, but as long as you’re going with established people, then trust us, they’ll have plenty of experience in that regard. Experienced videographers work with different photographers all the time and the best ones have a whole system in place for communicating and ensuring not only that they don’t get in each other’s way and shots, but also that they can work together so they both end up with the best possible pictures and footage. Our NJ wedding videographers know exactly what you can expect, and what you think you can. While it’s perfectly understandable to not fully know what to expect from your wedding videographers, the bottom line is that you shouldn’t let your misguided expectations dictate your decisions. You need to have an idea of what you can really expect from any vendor you work with before choosing them, and we hope these tips help. Good luck!